The Liddell-Scott-Jones Greek-English lexicon defines παράδοξος (paradoxos) as “contrary to expectation, incredible”— a definition more closely associated with the Gk. thauma (wonder, marvel) than with mega (great, mighty). Necessary Digression: Henry Liddell of the Liddell-Scott Greek-English lexicons was the father of the Alice who inspired Alice in Wonderland, itself a realm of paradoxes and curiosities. παράδοξος was also a title applied to distinguished athletes, musicians, and artists: the Admirable. In this sense it includes an invitation to look at and wonder about some person or creative act. Mira! Come and See! Behold! Listen up, world! [Dare I add Hwaet?] Selah. I love this aspect of the Christmas story. Despite ancient prophecies pointing to the Messiah, the story of the birth of Christ is filled with paradox. 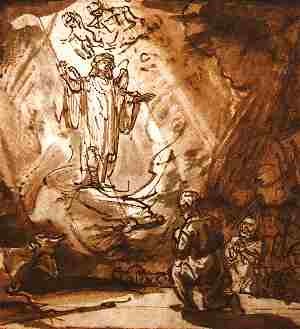 Despite centuries of saying “How Long, O Lord?” the long-expected Jesus comes unexpectedly. 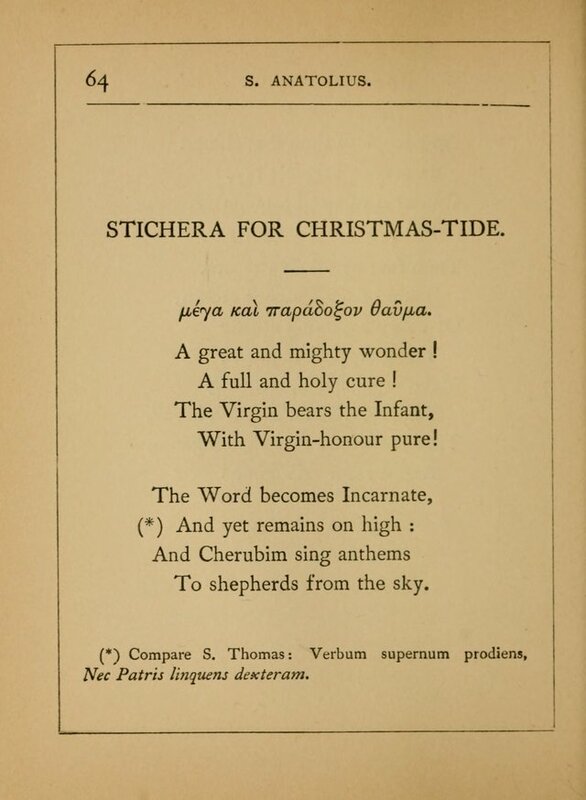 And the great and paradoxical wonder of Christmas is highlighted in this hymn. “The Virgin bears the Infant.” “The Word becomes Incarnate…” (itself a paradox) “…and yet remains on high” (curiouser and curiouser). 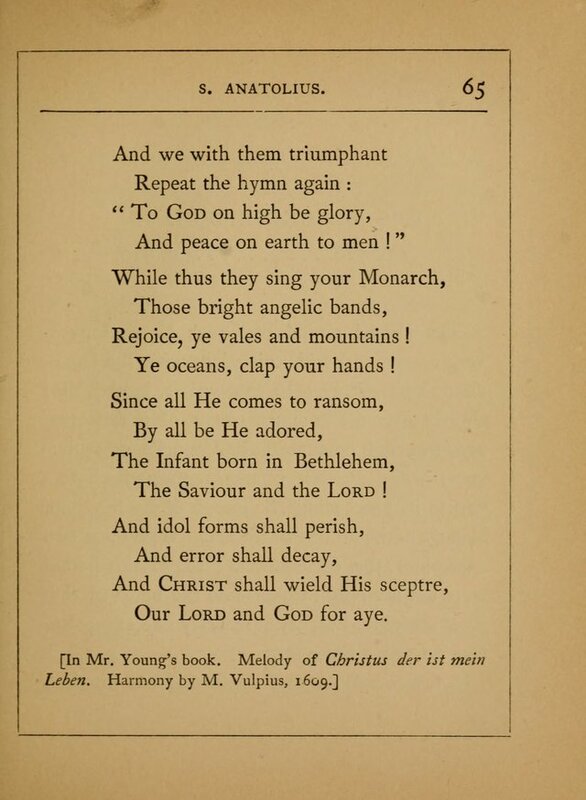 “The cherubim sing anthems / To shepherds from the sky”: Surely that was contrary to expectation! “The infant… the Savior and the Lord”: How could something so helpless, so poor, so peripheral to the goings-on of a tiny town in a sulky region of the Roman empire become the “good news of great joy that will be for all the people,” the panacea of the world, “a full and holy cure”? Forced by a government census, inevitable and inconvenient taxation, and ostensibly accidental lineage to travel miles in her third trimester, Mary gives birth in the foretold place and at the fullness of time to a son (given unto us!) who will be called the Everlasting Father. And consider this, Caesar: the government will rest on his shoulders. That’s paradox and irony. The wise men seeking a newborn king will stop by a palace first, but will find that this king’s home is homely. Paradox. At the dedication of the infant in the temple, the aged Simeon speaks the words of the Nunc Dimittis–so intimate, yet so universal. And Joseph and Mary’s response? They’ve already heard from angels, but they marvel anew at the old man’s proclamation, this mega kai paradoxon thauma. To God on high be glory! The older I get, the more I see the beauty of repetition and return, of joining in the rhythms of the natural and liturgical seasons, in the chorus of generations past, in patterns of praise. It’s utterly humbling to receive an invitation to be a part of this grand swell; at the same time it’s awfully bold to believe one might exhort or conduct Nature into the hymn she has already been singing long before any of us were born: “Rejoice, ye vales and mountains, / Ye oceans, clap your hands.” The predictable, expected refrain of this hymn pairs beautifully with the wondrous paradoxes that fill the verses. This Christmas, I am reminded not just to turn from the last-minute shopping, the social engagements, the pleasant domestic chaos, and the to-do list to remember the story of Jesus’ birth. 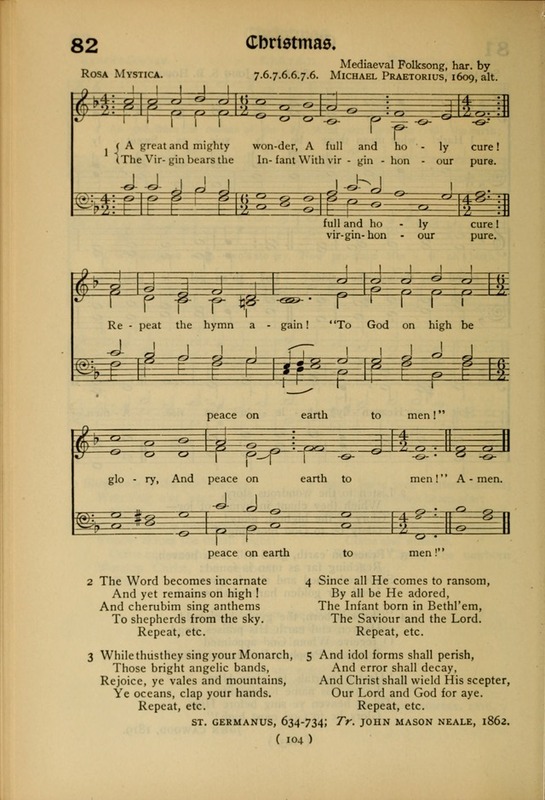 This hymn reminds me not just to remember, but to wonder. To revisit with the surprise of a first encounter. To anticipate something marvelous. To have faith in the incredible. To express gratitude to God for his inexpressible gift. To expect the long-expected unexpected, Jesus the Admirable.